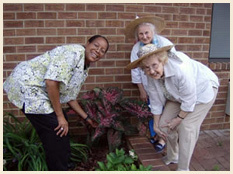 Residents are invited to participate in daily activities planned by our full-time activity coordinators. 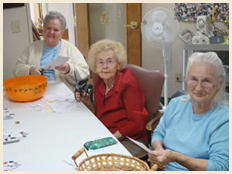 Favorite activities include quilting and craft classes, along with group excursions. Our sunroom and living room are inviting places for our residents to visit with friends and family or with Minnie, our house pet! Residents are served three nutritious meals (and three snacks) every day in our dining room.